MGS MOC Release No. MOC2-388, 11 June 2003 Many craters and troughs at polar and middle latitudes on Mars have gullies carved in their walls. These gullies may have formed by running water; others have suggested alternative, exotic fluids such as liquid or gaseous carbon dioxide. This view of martian gullies was acquired by the Mars Global Surveyor (MGS) Mars Orbiter Camera (MOC). 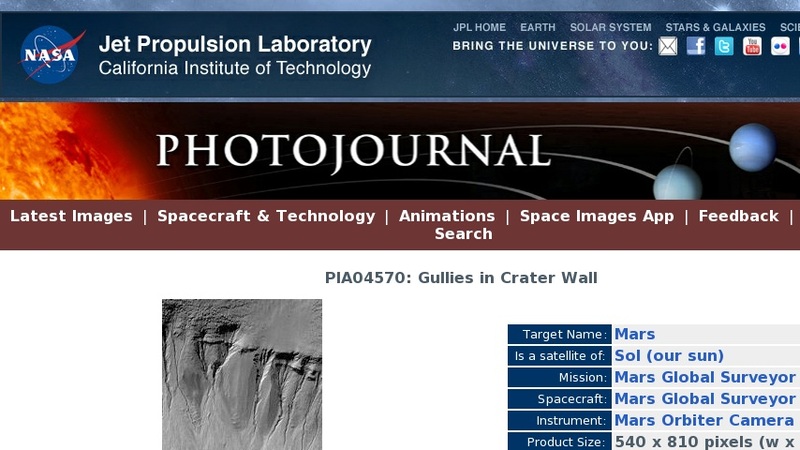 The image shows gullies in the wall of an old meteor impact crater near 39.0S, 200.7W. Sunlight illuminates the scene from the upper left.